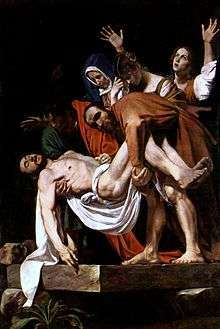 The hysteria of Mary of Clopas in Caravaggio's The Entombment of Christ (1602). Mary of Clopas (or of Cleopas) (Ancient Greek: Μαρία ἡ τοῦ Κλωπᾶ, María hē tou Clōpá), the wife of Clopas, was one of various Marys named in the New Testament. Now there stood by the cross of Jesus His mother, and His mother’s sister, Mary [the wife] of Clopas, and Mary Magdalene. The expression Mary of Clopas in the Greek text is ambiguous as to whether Mary was the daughter or wife of Clopas, but exegesis has commonly favoured the reading "wife of Clopas" (as reflected in above translation). 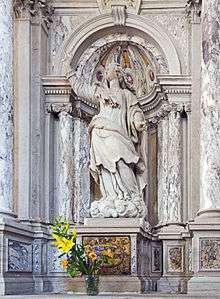 Hegesippus thought that Clopas was the brother of Saint Joseph. According to some interpretations, the same Mary was also among the women that on Easter morning went to the tomb to anoint Jesus' body with spices. Matthew 28:1 calls her "the other Mary" to distinguish her from Mary Magdalene, while Mark 16:1 uses the name "Mary of James", most probably derived from James the Less. The Latin version of that name, Maria Iacobi, is often used in tradition. Stephen S. Smalley (1982) says that it is "probable" (but not virtually certain) that Mary of Clopas is Mary the mother of James son of Alphaeus. For detailed explanations, please see: Brothers of Jesus and James the brother of Jesus. Adding to the confusion, the Gospel of Philip seems to refer to her as Jesus' mother's sister ("her sister") and Jesus' own sister ("his sister"). An early tradition within the Roman Catholic Church identify Mary of Clopas being the sister (or sister-in-law) of Mary the Mother of Jesus. In the Roman Martyrology she is remembered with Saint Salome on April 24. Some have regarded Mary as the daughter of Clopas, who was in turn one of the husbands of Saint Anne. James Tabor suggests that she is, in fact, Mary, the mother of Jesus and that Clopas was her second husband. ↑ The Old and New Testament and Gnostic contexts and the text are discussed by Robert M. Grant, "The Mystery of Marriage in the Gospel of Philip" Vigiliae Christianae 15.3 (September 1961:129-140). ↑ Herbermann, Charles, ed. (1913). "St. Anne". Catholic Encyclopedia. New York: Robert Appleton Company. ↑ Tabor, James (2006). The Jesus Dynasty. Simon & Schuster. pp. 90–91. Wikisource has the text of the 1913 Catholic Encyclopedia article Mary of Cleophas.